the heliosphere just keeps getting thinner and thinner with distance from the Sun. So where does all of the matter go? It doesn't keep blowing a bigger and bigger bubble, and there is no accumulation at the heliopause. I "think" that the only conclusion is that the matter rains back down to the Sun. One big problem is that we have no idea what is that actual Form of the Heliopause. The shapes depicted by NASA are pure conjecture based on terrestrial satellite data and classic hydrodynamics. Suppose for a moment that the Heliosheath, and your posited Debye sheath, proximate the form and volume of a Hill Sphere. ~and we might get a better picture of the solar system's orientation in the galaxy ! - LK said: Do you know what evidence the idea of the heliopause termination shock is based on? - LK said: Is the heliopause too thin to affect large objects from outside entering the solar system? - CC said: I'm not sure. I'd have to look at the charge densities in the Pioneer data. Also, hypersonic objects build up halos around them, which insulate them from their environments, as my work on bolides demonstrated. To get a discharge, the potential has to exceed that insulating capacity. Actually predicting when a bolide is going to flare up is beyond our ability, so I should refrain from saying for sure that Saturn would have flared up crossing the heliopause. The following older info seems to help explain things quite a bit. After posting this, I hope to find out if current info still agrees with the data presented here. Underlinings below are mine. Until 1972 most observations of the VLISM [very local ISM] involved averages over distances of 100 parsecs or more. From the observations of Faraday rotation and dispersion of pulsar emissions, it was deduced that the average electron density is ~ 0.03 per cubic centimeter and the magnetic field strength is ~ 0.3nT, with large fluctuations of the same order. Radio observations of the 21 cm interstellar line suggested density of neutral hydrogen on the order of 0.7 per cubic centimeter, considerably higher than the value obtained from measurements of Lyman alpha absorption in the spectra of nearby early type stars, namely about 0.1 per cubic centimeter. We do not presently have significantly better values for the electron density and magnetic field strength, but the situation with regard to neutral hydrogen and helium has greatly improved. Observations made from the spacecraft OGO 5 led to the remarkable result that interstellar neutral hydrogen is detectable as a consequence of the backscattering of solar Lyman alpha within ~ 5 AU and that the direction of approach is not from the solar apex but close to the projection of the apex direction onto the ecliptic plane. The heliocentric distance of penetration is determined easily by measuring the parallax of the Lyman alpha emission from observations made from the vicinity of the Earth at different times during the year. The forces acting on a neutral hydrogen atom approaching the Sun are gravity and the radiation pressure. In addition, atoms are lost, mainly as a result of charge exchange with solar wind protons which converts a fast solar wind proton into a fast hydrogen atom. The proton of interstellar origin is "picked up" by the interplanetary electric and magnetic fields. The heliocentric distance to which interstellar atoms having a relative speed of ~ 20 km/s can penetrate before the probability of loss by charge exchange becomes high is about 4 AU, corresponding roughly to the distance obtained from the OGO 5 parallax measurements. The brightness distribution of scattered solar Lyman alpha corresponding to a given neutral hydrogen density distribution can be computed and compared with observations, provided one knows the shape of the solar Lyman alpha emission line. However, it is not easy to determine the inflow speed of the neutral beam, U, and the loss mean free path, lambda, separately. Hence the value deduced for U is rendered uncertain by the uncertainties in evaluating lambda. For the case of interstellar neutral helium the situation is different because radiation pressure has negligible effect and the value of lambda is such that the neutral beam penetrates to well within 1 AU if U~ 20 km/s. The interesting conclusion that can be drawn from measurements of scattered solar HeI 584 Å radiation is that the maximum intensity should occur in the downwind direction, looking along the accretion axis, rather than in the upwind direction as in the case of hydrogen. This provides a straightforward means of determining the direction of the interstellar wind. The early results from observations of scattered Lyman alpha and HeI 584 have been confirmed and refined by the neutral helium experiment on Ulysses and by direct observation of pickup ions on AMPTE. Very accurate values have been found for the speed and direction of the helium wind together with a good value for the temperature. These consensus results are given in Table 1. With regard to the cosmic ray pressure in Table 1, the heliosphere is near a bubble of hot gas, evidently recent and not necessarily in equilibrium as far as locally produced cosmic rays are concerned, so it is possible that a low energy component exists locally and contributes to the total pressure. If this does happen, the shock itself will be thickened and made more turbulent in the course of the interaction. Returning to the interstellar pick-up ions, they have an interesting fate. After entering the heliosphere initially as neutral atoms, being ionized, and then picked up, they are carried out to the termination shock. There, a small percentage are accelerated to cosmic ray energies and then propagate back into the inner heliosphere where they are observed as "anomalous cosmic rays." This process has recently been confirmed by the observervation on AMPTE and Ulysses that anomalous cosmic rays are, indeed, singly ionized. With regard to interstellar plasma, soft x-ray observations suggest that the Sun is located within an irregular region of hot (~ million degree K), low density (~ 0.05 per cubic centimeter) plasma with dimensions of the order of tens to hundreds of parsecs. This "local bubble" of hot plasma must have been produced by a combination of one or more supernovae and stellar winds associated with a group of O and B stars. However, it is quite clear that the VLISM does not have the same characteristics as the local bubble material as a whole since it contains neutrals having a temperature of only ~ 7000 K. The Sun is usually considered to be immersed in a region of "local fluff" that is relatively cool and dense. Since one would expect to have pressure balance between the fluff and the hot medium it would seem to be necessary that the former contains an unobservable component of plasma and magnetic field which would have p/k ~ 10,000 degrees K per cubic centimeter to compensate for the very low pressure of the observed neutrals described above (p/k < 10,000 degrees K per cubic centimeter). This seems rather too large unless the pressure is mainly magnetic which would require BI ~0.6nT. The plasma alone would have to have n >1 per cubic centimeter to be able to produce such a hydrostatic pressure and its ram pressure would put the solar wind termination shock at R ~ 30AU, whereas direct observation places it beyond 50 AU. The relative abundances of hydrogen and helium atoms in the VLISM given in Table 1 suggest that the density of the ionized component (mainly protons) is not greater than about 0.3 per cubic centimeter. If the termination shock is assumed to lie at ~ 100 AU, more reasonable values for the density (~ 0.1per cubic centimeter) can be accommodated if there is also a significant magnetic field (B~ 3-5nT) and this can provide a match to the hydrostatic presure in the local bubble if the latter has been slightly over-estimated by say a factor of 2. The collision time between interstellar neutral atoms and ions is ca. 1000 years and the mean free path is 1000 to 10,000 AU, both of which are small enough so neutral atoms must be moving together with, and have the same temperature as the interstellar plasma in the local fluff. The neutral beam velocity vector gives us the plasma velocity vector. This forces the conclusion that there is an interstellar wind blowing on the heliosphere in the ecliptic plane, at a speed, VI = U = 25 km/s. The plasma density is < 0.3 per cubic centimeter and its temperature is ~ 7000 K. The existence of this wind is the reason the stagnation point flow shown in Figure 2 [http://web.mit.edu/space/www/helio.review/axford.RTF2.gif] is accepted as the most likely configuration for the heliosphere. Guided by Table 1, the fast mode speed, cf, in the local fluff may be between 10 and 40 km/s (the sound speed is 10 km/s). Thus, VI may be larger than cf which would modify the configuration shown in Figure 2 [http://web.mit.edu/space/www/helio.review/axford.RTF2.gif] in three ways. First, a bow shock can form, much like the bow shock in front of the Earth`s magnetosphere. Second, if VI is supersonic, the pressure on the downstream side and flanks of the termination shock is reduced, causing the shock to be further from the Sun in these directions. These two effects have been numerically modeled in a few cases, an example of which is shown in Figure 3 in which VI is assumed to be highly supersonic (The empty circle inside the termination shock represents the inner boundary for the calculation and has no physical significance.). Thirdly, since BI will generally not be aligned with the heliotail, the configuration will no longer be axisymmetric about the heliotail axis. However, effects of an arbitrary BI have not yet been incorporated into numerical simulations. Figure 3 represents an important extension to our understanding of the heliosphere. It is a model constructed for parameters like those in Table 1, neglecting the effects of the interstellar magnetic field. The distance to the shock in the downstream direction is more than twice that in the upstream direction so that a spacecraft travelling upstream would meet the shock much sooner than in any other direction. This is, indeed, fortuitous because Voyagers 1 and 2 are both travelling in the upstream direction at distances near 50 AU and both will survive to encounter the upstream shock if it lies inside 120 AU. Even more interesting is the result that the heliosheath in the upstream direction, between the termination shock and the heliopause, can be very thin. It may require only a few more years for Voyagers 1 and 2 to pass through the sheath and into the interstellar medium - an opportunity worth hoping for. There are many things that have still been ignored in models. For example, the solar wind dynamic pressure depends both on time and on position. It is likely that the termination shock will consequently move inward and outward over the solar cycle by many AU, and by a few AU over times as short as one month. Thus, during encounters with the shock by Voyages 1 and 2 the shock may move back and forth over the spacecraft several times once the shock is first encountered. Also ignored are the magnetic fields in the solar wind and the interstellar medium. Both magnetic fields will modify the shape and position of the heliopause and these fields control the access and motion of galactic cosmic rays into the heliosphere. With regard to shape of the shock, if the interstellar field is large enough so that VI < cf, the fast mode speed, then it is expected that the shock and heliopause will be more like the configuration shown in Figure 2. In this case, Pioneer 10, which is farther out than Voyagers 1 and 2, but is travelling more slowly in the downstream direction, may be the first spacecraft to reach the shock. The distances to the termination shock and to the heliopause are not known. Still, with equation (1) and more sophisticated derivative calculations, it is possible to make estimates. Figure 4 shows such a calculation of the shock distance in the upstream direction for a range of interstellar field strengths and densities. The estimated values for R range between 60 and 150 AU for the parameters from Table 1. This now forces the question of whether there is a way of remotely determining R. This influences whether we will continue to collect data from spacecraft in the outer heliosphere. If Pioneer 10 and Voyagers 1/2 have any possibility of passing the shock and the heliopause, it would be a great addition to our knowledge of the heliosphere. Only a finite time exists because Pioneer 10 has about reached its limits and the Voyagers will run out of electrical power by about 2030. There have, in fact, been several tentative remote detections of the termination shock and heliopause. Of these, probably the most tantalizing is the detection of radio emissions coming from the outer heliosphere. It is hypothesized that the emissions are coming from the nose of the heliopause - the stagnation point, and that the distance to the stagnation point is somewhere between 116 and 177 AU. These distances place R between 60 and 160 AU, which is reachable by the Voyager spacecraft. There are also suggestions of a small value for R from cosmic ray modulation over the solar cycle, but this is highly tentative because we still do not have a good understanding of galactic cosmic ray access to and propagation in the heliosphere. To summarize, the heliosphere is probably well represented as stagnation point flow occurring between the solar wind and an interstellar wind. The resulting configuration is similar to the Earth's magnetosphere. Inside the heliopause, the solar wind passes through a termination shock that is elongated in the downstream direction and which is moving back and forth at speeds up to 100 km/s. The presence of three spacecraft in the outer heliosphere is a unique opportunity to explore the structure and properties of the termination shock, heliosheath, heliopause, and VLISM. This opportunity is realizable based on the indirect evidence we have that R is probably ~ 100, and may be as small as 60-70 AU. Last edited by Lloyd on Sat Oct 31, 2015 8:16 am, edited 2 times in total. In my previous post I think the electron density at the heliopause was predicted in 1994 to be .3 electrons/cc, but below in the first excerpt it seems to say that it's only .08/cc, which is 3 or 4 times less. The 2nd excerpt seems to say that protons decreased from 25/s to 2/s at the heliopause. The 3rd excerpt says some protons are produced by ionization of ENAs, i.e. neutral atoms. So, Charles, does any of this tell us if there should be any flare up at the heliopause if a large body enters? And do you have comments on any of the rest of this added material, including in my previous post? ... A powerful solar eruption caused electrons in Voyager 1's location to vibrate signficantly between April 9 and May 22 of this year. The probe's plasma wave instrument detected these oscillations, and researchers used the measurements to figure out that Voyager 1's surroundings contained about 0.08 electrons per cubic centimeter. - That's far higher than the density observed in the outer regions of the heliosphere (roughly 0.002 electrons per cubic cm) and very much in line with the 0.10 electrons per cubic cm or so expected in interstellar space. ... As of 2008, there is a previously unpredicted narrow ribbon of ENAs (energetic neutral atoms). - As of October 2009, the heliosphere may be bubble, not comet shaped. - As of October 2010, significant changes were detected in the ribbon after 6 months, based on the second set of IBEX observations. - As of June 2011, the heliosheath area is thought to be filled with magnetic bubbles (each about 1 AU wide), creating a "foamy zone". The theory helps explain in situ heliosphere measurements by the two Voyager probes. - As of May 2012, IBEX data implies there is probably not a bow "shock". 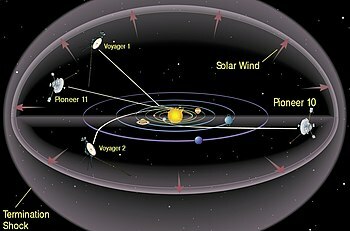 - As of June 2012 at 119 AU Voyager 1 detected an increase in cosmic rays. - Between late August and early September 2012, Voyager 1 witnessed a sharp drop in protons from the sun, from 25 particles per sec in late August, to about 2 particles per second by early October. It was later determined that it entered interstellar space on August 25, 2012. Pick-up protons 1, 2 and 3 are born in the outer heliosheath owing to ionization of heliospheric ENAs. The following older info seems to help explain things quite a bit. After posting this, I hope to find out if current info still agrees with the data presented here. I'm not questioning that there are changes at the heliopause. I'm questioning the significance. You go from a density of 10-3 particles / cm3 inside the heliosphere, to 10-1 in the interstellar medium. So the ISM is two orders of magnitude more dense than the IPM just inside the heliopause. This is interesting because the IPM is only one order of magnitude hotter than the ISM, which doesn't fully account for the difference in density, just considering hydrostatics. Scientists acknowledge that there might be a magnetic field at work, but they don't specify how, and they don't consider simple electrostatics -- the net positive charge inside the heliosphere will cause the outer reaches to bloat, even if the ions are still weakly bound to the net negative charge in the Sun. Well, whatever. But the point here is the significance. The finest vacuum ever achieved in the laboratory was 1010 particles / cm3, and we're talking about 10-1 particles, or less, at the heliopause? I just don't see the significance of near infinitesimal forces in a near perfect vacuum. This certainly isn't in the same league as the densities in the solar corona, so I don't see why it would be included in solar modeling. So, Charles, does any of this tell us if there should be any flare up at the heliopause if a large body enters? For now, I'll stick with my opinion that predicting flare-ups is extremely difficult. As concerns bolides, it isn't a discharge between the bolide and the surrounding medium -- it's a discharge between the bolide and the bow shock. So the surrounding medium isn't necessarily much of a player, and the more important factors all have to do with the bolide itself. The same would be true of a large object crossing the heliopause. found that the direction of the magnetic field has been slowly turning ever since the spacecraft crossed into interstellar space. They believe this is an effect of the nearby boundary of the solar wind, a stream of charged particles that comes from the sun. Need more probes to follow the flows. Does the Equatorial Current Sheet partially recycle to the poles ? seasmith wrote: Does the Equatorial Current Sheet partially recycle to the poles? Well, it has to go somewhere, and it certainly isn't pressing deeper into the interstellar medium, or they wouldn't have found a heliopause. Note that they're talking about the solar wind, not the heliospheric current sheet (which supposedly doesn't stay organized much past 10 AU). And yet they're also talking about magnetic fields associated with the solar wind, which the solar wind wouldn't have unless it was charged. So is that actually the HCS, staying organized all of the way out to the heliopause? Does the HCS hit the heliopause and then splay toward the poles, and return from there, in an Alfven-like current? Or kinda like a unipolar motor? Is that a net-negative current, like it is nearer the Sun? Or is that a different current? That's the model i've been advocating, but only some portion of it would be recycled axially. Somewhat similar to a Venturi, or hydraulic trash pump driven by a mechanical shaft; but here the medium being ions and energetic neutral nucleii instead of water, the centrifigal rotation is via the magnetic field, and driven by an axial current. Is that a net-negative current ..? It would be both positive And negative currents, if the sun has a quadra-polar magnetic field, as i think it must. Hill Sphere influence as well. SS said: centrifugal rotation is via the magnetic field, and driven by an axial current. Do you mean centrifugal rotation of the Sun? Are you assuming that a galactic electric current powers the Sun or its rotation? SS: It would be both positive And negative currents, if the sun has a quadra-polar magnetic field, as i think it must. Why should the Sun have a quadripolar magnetic field? Faraday motor/generator is relevant, but we probably shouldn't ignore a (confluent) Hill Sphere influence as well. Hill Sphere refers to the spherical boundary of a body's gravitational influence, along with that of its satellites. Doesn't it? What confluent Hill Spheres are you referring to? - the Sun's and another star's? Charles, below are notes I just took on the SAFIRE video. Do you have any comments? They say they're testing the Electric Sun model, but they're really just testing the Anode Sun model, it appears. Right? We found that plasma made its own concentric stratified atmospheres, up to 15 or more, spinning around each other. The plasma was extremely sensitive to any charge or magnetic field. When we zoomed into the core, we found a dark layer between it and the extremely hot ion cloud. The ions didn't act normally by going out to the next layer; they appeared to be trapped. Then they got even hotter and denser and the cloud got so hot, it blew off into the chamber atmosphere. There was a pressure spike. Although power was limited to 1500 watts DC, the oscilloscope measured short-lived power surges of 2 MW and up to 10 MW. For perspective, the largest nuclear power plant in Canada produces 7 MW. In some states the plasma wouldn't accept more power, but in others it accepted all the power available. There was line broadening, which means higher temperatures the farther we went from the anode. Intensity scans indicated electron and ion trapping between the double layers. There was a heart-beat like wave detected, which seemed odd from DC power. Copious amounts of a mass of 3 were produced. Was it helium, tritium. If it's helium-3, then SAFIRE produced fusion. We are designing a probe similar to NASA's probe of the Sun's corona. The design of the SAFIRE chamber (3m^3) and probes is then shown. They plan to test possible comet material too, to see what kinds of ion tails may be detected, like with existing comets. Yes -- no surprises there -- it was clear to me back in 2012 that the objective was to validate the existing Anode Sun model. He said that he doesn't have a horse in this race, and yet he said that there are only two possibilities -- either the Sun is a fusion furnace driven by gravity, or it's an anode discharging into a negatively charged heliosphere, releasing electrical energy -- I think that's what they call a false dichotomy. But until they publish the specifications for the apparatus, there really isn't much else to comment on. You're right, centrifugal was a poor choice of words. Perhaps 'circulation via magnetic fields' would be more accurate, but magnetic twist and plasmoid rotation are probably part-and-parcel so to speak. Yes, galactic currents as prime drivers. A quadrupolar moment would explain the observed dominant N-S pole asymmetry, and also the sliding and then "flipping" of the poles concurrent with the ~11-22 year sunspot cycle. In other words, both magnetic axis are already there before the re-alignment. imo, the presence of two orthogonal electric currents would also predicate quadrupolar effects. SS: your Faraday motor/generator is relevant, but we probably shouldn't ignore a (confluent) Hill Sphere influence as well. A Hill Sphere (singular) that is confluent with the heliospheric magnetosphere. The term becomes "spheres" when the planets of the solar system are added in to the mix and, again only in my opinion, the planets need to be considered when trying to explain the solar cycles and sun spots. The 60-120 degree spacing of LaGrange zones have resonances in Sumerian astronomy which have never really been explained.